Every Monday morning I find myself in Jackson Heights as I attempt to defeat my common allergies. Do allergy shots work? Who knows? What I do know is that I'm not allergic to these tacos and as long as they're here on the corner of 75th street and Roosevelt ave, I'll be here every Monday. I had a chorizo and al pastor taco. 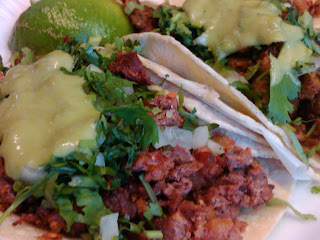 Generously served and tender meat mixed with a combination of flavorful spices, onions, cilantro and real saucy guac. Stay tuned for the rise of the taco trucks. They seem to be sprouting all over NYC slowly conquering the halal street meat strongholds.